As I write this, people in New Zealand have already celebrated the New Year. I’m still at work (but have been given permission by my boss to go home so don’t feel too bad writing this!) but will be going soon. I said that this year wasn’t going to be like 2007-2009, where I’ve stayed in the same job all year and not really done anything exciting, and I said I would actually go travelling and learn Spanish, something I always meant to do. And I would get out of full time work and go self-employed. In that respect I feel like this year was a complete success. I went to Costa Rica, Peru, Los Angeles and Las Vegas, as well as New Zealand twice in one year. And, after three months travelling, I went back into my old job as a contractor, and then not long after that found a new job. I feel like i should have done this years ago. But I was very lucky because an old colleague got me my new job and so it might not have been so easy for me if I’d done it any sooner. So, what’s on the cards for 2011? I’ll be staying in my current contract as long as they let me, but after that who knows. I’d like to make the “travelling overseas for months at a time” a yearly thing, but of course that requires lots of saving and a flexible job. Finally though, I feel I’m a bit closer to that than I have been in previous years. It’s when I think about this sort of thing that I feel very fortunate I have the opportunity to do all this wonderful stuff. But I miss my family and friends in New Zealand immensely! It sounds a bit soppy but I feel those people who spend lots of happy time with their families are the luckiest people of them all. Yesterday I realised that the British Pound Sterling is worth less than 2 New Zealand Dollars for the first time in the history of the New Zealand Dollar. Considering I’m saving very hard here in the UK and hoping to send the money back to NZ one day, this left me feeling a bit sick. The worst bit is that it reached record lows some months back, has been falling since then and is showing no signs of stopping. Given the amount I save each month, every time the rate drops 0.05 (say, from 2.05 to 2.00), I have to save for an extra 2 months just to get back to where I was (in $NZ terms). Considering that the rate was 2.85 just over eighteen months ago, it feels a bit like all my saving over the last two years has been for nothing, and it’s only going to get worse. I’m hoping that it’s largely due to the fact that the Bank of England base rate (bank lending rate that mortgages are based on) is also at its lowest point in the history of the Bank of England (300+ years). It’s currently at 0.5%, and it’s widely known that there’s only one way interest rates can go from here, and that’s up. Hopefully when that happens, the GBP/NZD rate will go up with it. Yes, working in a bank you learn boring stuff like that! For those of you in NZ that look at the rate the other way, the NZD/GBP rate has gone above 0.50 for the first time ever. So, the “Boris Bikes”… thumbs up or thumbs down? I give them a thumbs up… just. To sum up, London’s cycle hire is great for tourists and casual users who want to get from A to B and who aren’t in a hurry. But I believe they’re too unreliable to use as a serious long-term method of transportation. Allow me to elaborate, if you will. I was invited to a friend’s Christmas dinner on Christmas Day, and in London there is no public transport at all on Christmas Day, or so I thought. So I had walked 45 minutes across Central London to get to my friend’s house, and just before I got there I saw the blue Barclay’s bikes sitting there gleaming, and thought “what a great idea”! I knew that starting this month, you were able to hire the bikes using just a credit card (before this month you had to pre-register and purchase a key). And I also knew that the minimum hire period was 24 hours and also that the next day there was to be a tube strike. So, I thought, this was the best time to try them out. By the end of dinner I had had three glasses of wine but was still able to walk in a straight line so I went to the hire bikes which were conveniently located almost right outside my friend’s place in Clerkenwell. After selecting that I wanted a 24-hour hire period, I was prompted to put my credit card into the machine so it could take off £1. I did that, and put in my PIN number. But then, the machine just went back to the main menu. No “here’s what you do next”, no bike got released, not even a “have a lovely day”. So, after 30 seconds of standing there with a dumb look on my face, I decided to go through the process again. I put in my credit card again and my PIN number again. I always laugh at people who do that when they are on the tube. They swipe their Oyster Card to get into the tube, but “computer says no”. Or more accurately, “computer says Seek Assistance”. So they try their card again, and again, and again, thinking that despite trying their Oyster Card thirty-seven times, perhaps on the thirty-eighth time it might work. But I digress. This time, after entering my credit card and PIN for the second time, it worked! Out came a piece of paper with a code on it, and I had to enter this code onto one of the bike stands and it would release the bike. This I did, and took off with the bike and made my merry way down Aldersgate Street, Cannon Street and the hill by London Bridge. It was fun, because I hadn’t been on a bike for so long, and easy because there was absolutely no traffic in the City on Christmas night. It was also easy because it was almost entirely downhill. It took me 5 minutes to work out how to change gears, and only a small amount less time to work out how to adjust the seat. At Bermondsey, I put my bike into the one available spot – they were all taken except one. Written on the bike were instructions saying that you need to expect a green light when you put your bike away to confirm that your journey is registered as having finished. This is exactly what happened, so I wandered off. If there are no spaces to put your bike, you’re supposed to (as I understand) register this on the terminal and it will give you 15 minutes more free time to find another one. As I’d just taken the last spot, I decided to try this out. The option was there, but it was unavailable (greyed out). Oh well, I thought, luckily I didn’t need it this time. When I got inside I went straight onto the cycle hire map to see if I had in fact picked the closest docking station to my house. I had, but when I clicked it, it said “2 spaces available”, meaning there were two empty spots to put your bike into. “Lies, all LIES!” I thought. True, it’s possible that between the time I dropped off the bike and the time I got home two bikes had been rented, but in the three minutes it took to get home from the docking station, I thought it unlikely at that time of night on Christmas Day. Rating on this occasion: 8 / 10 because I had to go through the registration procedure twice before it gave me a bike. I wanted to catch the bus north west and the particular bus I needed left from Oxford Circus, so my plan was to hire a bike from my place in Bermondsey and ride it to Oxford Circus, leave it there and get the bus. You’re allowed the bike for 30 minutes each time before they charge you extra, and then you have to leave the bike alone for 5 minutes before you take another. “No problem, I can do that in 30 minutes”, I thought. So I swiped my credit card, and it knew I was registered from yesterday, and printed me another code for a bike. Simple! I decided to go via St Pauls Cathedral and Holborn Station. Silly me – St Pauls Cathedral is on top of a MASSIVE HILL. Well, it’s not massive really… but when you haven’t been on a bike in years, all of London’s hills suddenly turn into mountains. After 25 minutes I had only made it as far as Holborn (boy, I’m more unfit that I thought), and I dropped off the bike there just in case I couldn’t find a place to drop it at Oxford Circus within the 30 minute time limit. No problems there… except I could barely walk once I got off the bike because my legs were so sore. I would like to say to that reviewer… bite me. Rating on this occasion: 10 / 10 – no problems. After walking for 5 minutes I was eligible to take another bike. So at Tottenham Court Road I thought I’d get another bike, despite Oxford Circus being no more than 5 minutes’ walk away. “Why not”, I thought, “since it’s free”. There were three bikes left at this particular docking station. I picked one, and this time tried to adjust the seat before taking the bike, that way it doesn’t count towards my 30 minutes. But no dice – the seat was stuck on the lowest setting, so unsuitable. I got my release code by inserting my credit card, however, when I tried to enter it and take a bike, I got no response from the machine – nothing, no red light (you were supposed to get a red light if something was wrong), no green light, no light at all, and the bike was still locked. I wasn’t sure why it wasn’t working – I thought maybe I’d typed the code wrong. The actual buttons you have to press to enter your code are awful – they’re not raised, it’s almost like they’re just painted on, and when it’s minus 1 degrees and your hands are frozen, it’s really hard to type a five digit number on tiny buttons that don’t register when they’re pressed. So I tried the third and last bike, and when I entered my code, I got a flashing red light. As a first time user I had no idea of what this meant (still don’t). But, what I did know is that if you take a bike out and don’t return it, it’s a fine of between £150 and £300. Because the system had clearly malfunctioned, for all I knew it thought I had a bike out. Therefore I didn’t have much choice except to phone the helpline right there and then. They wanted 20p a minute to phone their premium rate number. Not bloody likely! Luckily I found an alternative number to call that was 020 (free) and talked to a really nice and polite lady who assured me that I was not registered as having a bike out, but couldn’t tell me why it wasn’t working for me at this docking station. She directed me to another one nearby, but I told her I would just walk as it would be less hassle. Rating on this occasion: 0 / 10 – it just didn’t work, and I had to call up their customer services on a potentially very expensive phone number. The traffic in West London was so bad on Boxing Day that I got off the bus I was on and walked. By this time, my phone had run out of batteries so I wasn’t able to look online and see where the nearest cycles were. The first ones I stumbled across were at Edgware Road Station. There was only one left. I thought “this one’s clearly faulty” (by virtue of it being the last bike there). I put my credit card in, tried to release the bike, and got a big fat red light. Grrrr. So I walked five minutes up the road to Marylebone, and tried to get a bike there. My release code didn’t work, but I put my credit card in again and got a new release code and it worked just fine this time. Off I went to Angel Islington. After being stuck in traffic on a bus for what felt like ever, suddenly having the freedom of a bike was really liberating. And I’m sure that if I did it more than once every few years and therefore actually got fit, it would make getting across Zone 1 quick and easy. Even though I was going along Marylebone Road and Euston Road, two of the busiest roads in Central London, it felt okay. There was a big bus lane so I had to avoid buses stopped in that lane (not hard) and the only cars that would get close to you were taxis (I assume they’re better trained to deal with cyclists than normal cars). But boy the hill by King’s Cross station (Pentonville Road) is a killer. I tried to get a big run-up at the bottom, but there were so many potholes and those bikes are heavy. So I didn’t get much of a run up, and I admit, only made it two-thirds of the way up the hill before I got off and pushed it the rest of the way up. Rating on this occasion: 7.5 / 10 – it was a pain because there was a bike at Edgware Road, but I couldn’t hire it. But the fun of riding a bike after being stuck in traffic for an hour was great. My whole reason for going to Angel was to go to Shakeaway. According to their website, they are open on Boxing Day, but I got there and they were shut. Sad! Because you have to wait 5 minutes between cycle hires, I had 5 minutes to wait out before taking another one. After 3 minutes I got bored, and put my credit card again. I was a bit nervous, but I thought “well the worst that can happen is it will say no, or I will get charged an extra £1″. It gave me a bike just fine and off I went. The route was almost the same as Ride number 1 from yesterday and it was all downhill. But there were lots of people out on the street this time, and everybody would stare as you rode past. Not that I mind, I like a bit of attention. The bikes are bright blue and have the Barclays Bank logo plastered over them in large letters since they are the sponsor. One kid yelled out “Barclays!!! !” but because I was going fast I didn’t have the necessary 90 seconds required to formulate a hilarious comeback. Rating on this occasion: 10 / 10 – no problems at all, and I didn’t even have to wait 5 minutes between hires. So there you have it. Averaging out the five ratings that I gave each of my five experiences means that I give the scheme as a whole a “slightly better than I expected” 7.1 / 10. I’ll definitely use it again if I feel like I need exercise, or if there’s a tube strike, or it’s a warm day. But I’ll never use it as a means of commuting to work or if I’m in a hurry – it’s just too unreliable currently. The bikes themselves were quite comfortable, but as I said they were really heavy which meant that you noticed every single pothole and bump in the road. I also found that I kept slipping forward on the seat and so the crown jewels kept getting hurt. But they were not cheaply made bikes. I intentionally waited a few days to post this review to see if I was ever charged extra for entering my PIN number twice, or for taking a second bike within 5 minutes. Nope, for 24 hours’ bike use and four actual cycle hires, I was charged the princely sum of £1. Really great. 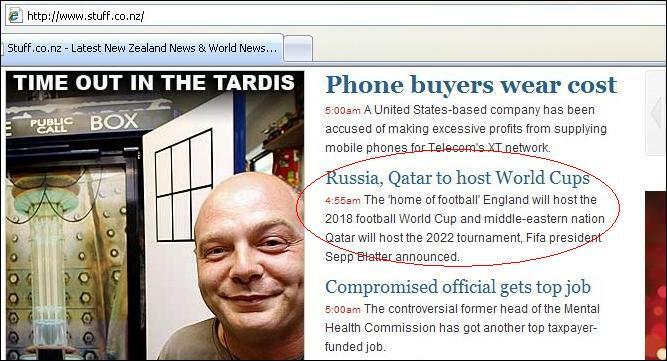 So I just checked the news, and according to stuff.co.nz, England are hosting the football world cup in 2018! That will come as quite a shock to football fans, considering that it’s actually Russia that was officially announced. Good on you stuff.co.nz – it’s been clear for a long time from reading their website that they don’t employ proofreaders, and this just proves it. Although in saying that, five minutes later this embarrassing mistake was off their website. But not before I captured a screenshot!!! The text says “The ‘home of football’ England will host the 2018 football World Cup and middle-eastern nation Qatar will host the 2022 tournament, Fifa president Sepp Blatter announced”. Heh what a cool name, Sepp Blatter. Anyway, it was clear that England weren’t going to host it, after reporters here ran stories about FIFA officials accepting bribes!